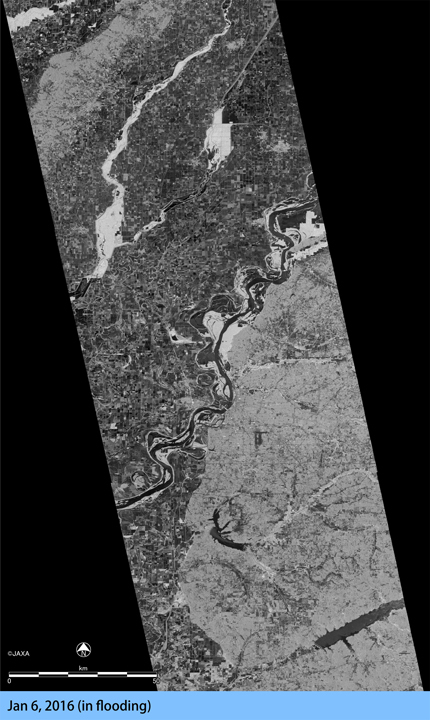 Corresponding to emergency requests from NASA and the International Charter of Space and Major Disasters for flooding of the Mississippi River, the Japan Aerospace Exploration Agency (JAXA) performed an emergency observation over the area shown in figure 1 by means of the Phased Array type L-band Synthetic Aperture Radar-2 (PALSAR-2) aboard the Advanced Land Observing Satellite-2 (ALOS-2, "DAICHI-2") on January 6, 2016. 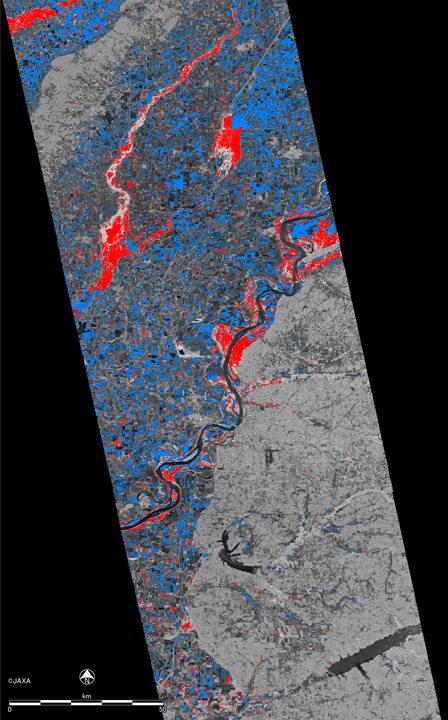 Figure 2 is an interactive comparison of the post-disaster image on Jan. 6, 2016 and a pre-disaster image on Sep. 30, 2015. Both images are acquired by high-resolution 10m mode. Fig.1: Observation area of the PALSAR-2 on January 6, 2016 (Red box). * Drag a slider over the image or click on the arbitrary position of the image to compare the images. Required browser: IE9 or later, Safari5.1 or later, Chrome, Firefox or Opera. 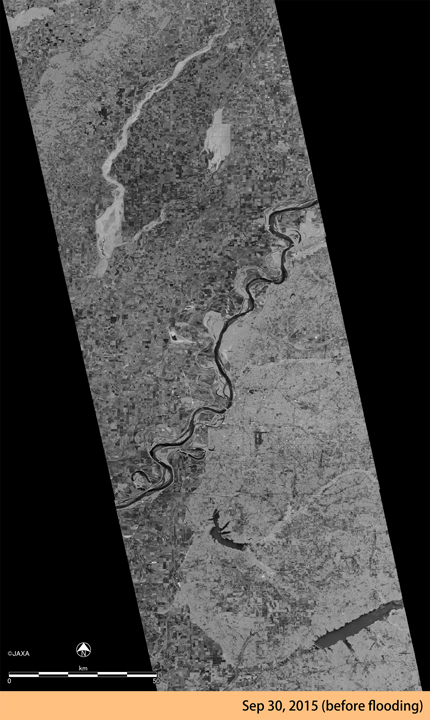 Figure 3 is the flood map obtained by change detection of the observation images. Blue area is considered to be covered with water but also contains normal seasonal change of agriculture fields. 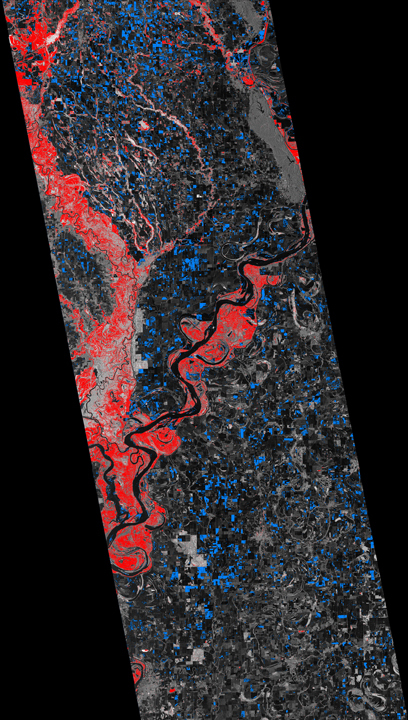 Red is inundation area under forests. 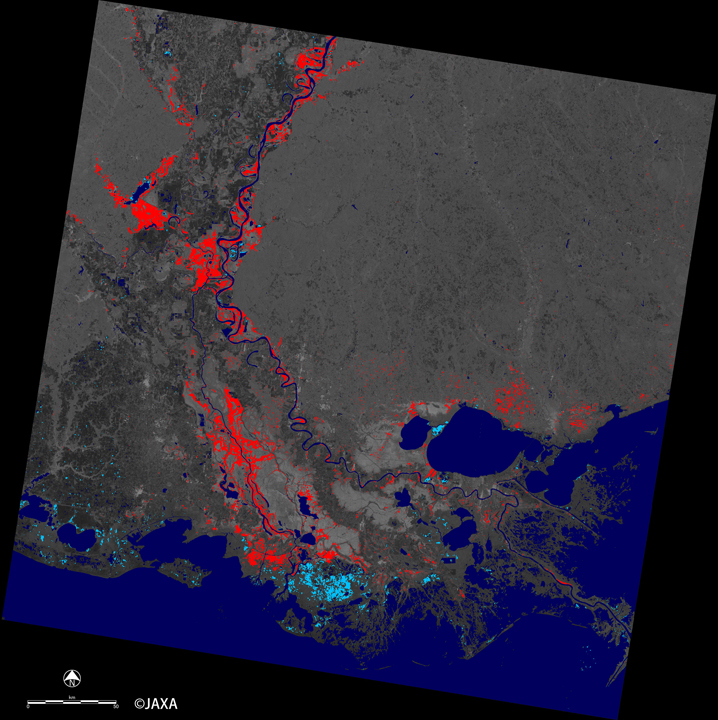 Corresponding on a request from the International Charter of Space and Major Disasters for flooding of the Mississippi River, JAXA observed the area shown in figure 4 by PALSAR-2 on Jan. 11, 2016. 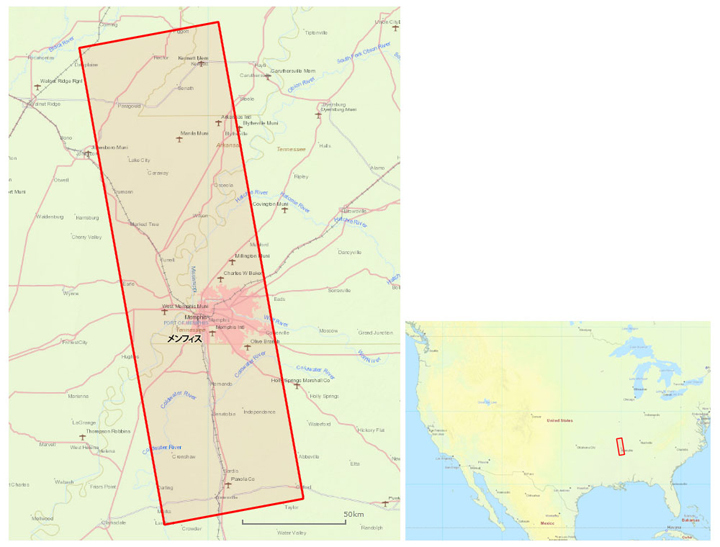 Figure 5 is the flood map obtained by the same process as figure 3. 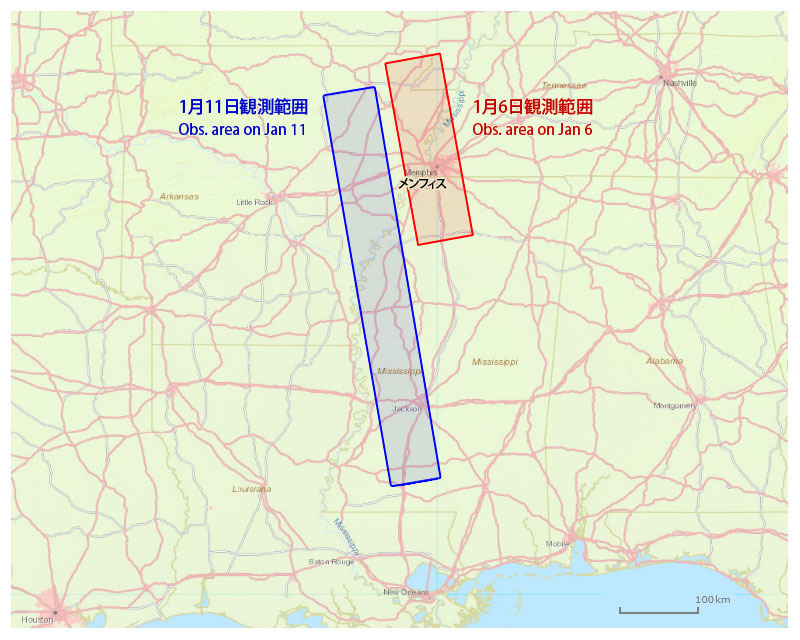 Fig.4: Observation area of the PALSAR-2 on Jan. 6 (Red box) and Jan. 11 (Blue box), 2016. JAXA observed the area shown in figure 6 by ScanSAR mode (swath width: 350km) of PALSAR-2 on Jan. 16, 2016. 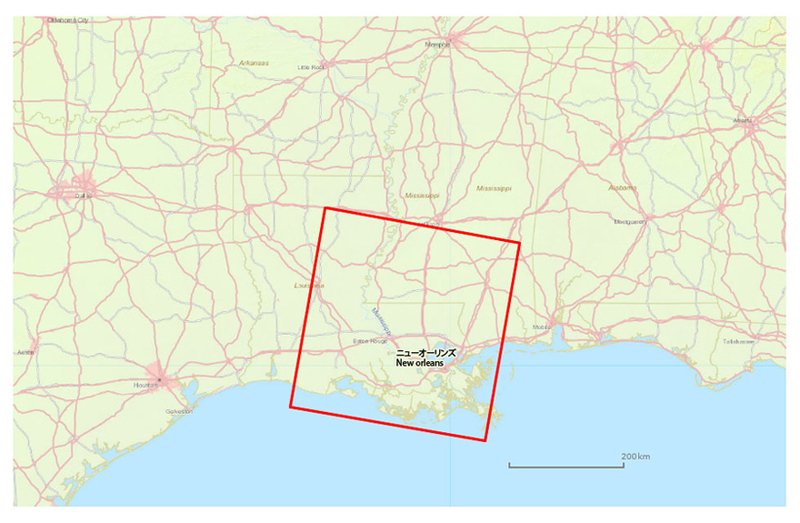 Figure 7 is the flood map obtained by the same process as figure 3. Fig.6: Observation area of the PALSAR-2 on Jan. 16, 2016 (Red box).